Capsular contracture surgery is the most common and effective method of correcting constriction of a breast implant. Capsular contracture is a symptomatic version of the natural and expected process which occurs during every implantation surgery. The body will always build a collagen-based scar capsule around any foreign object which has been surgically implanted under the skin. In women with contracture issues, this capsule shrinks tight around the implant causing visual distortion, hardening and pain. This report provides guidance for women who are seeking surgical repair of a troublesome contracture condition. Originally, doctors mostly treated capsular contracture non-surgically, using aggressive breast massage and closed capsulotomy techniques. These methods were mostly ineffective and sometimes even dangerous. Surgical correction of contracture is now the industry standard for dealing with compressed implant issues. There are several varieties of surgery which can be used and these are often combined with other treatments to maximize positive results for resolving contracture issues. Remember that once an incision is made, other procedures can often be integrated into the contracture correction, such as placing new prostheses, revising implant placement or performing a breast lift. Capsulotomy is when the surgeon scores the capsule and removes sections of it to free the implant from painful constriction. This procedure is relatively easy, but does not ensure that the contracture will not return. It might be best suited for a woman who is experiencing contracture of only a small area of the implant. Capsulectomy is also sometimes called a full capsulotomy. Capsulectomy is the complete removal of the scar capsule, often in one large piece. This procedure demonstrates the best results for relieving contracture symptoms. The surgery is rather involved and will require substantial recovery time, but is often the best choice for completely resolving the contracture condition. If you have severe contracture, a capsulectomy is certainly the procedure you will need. 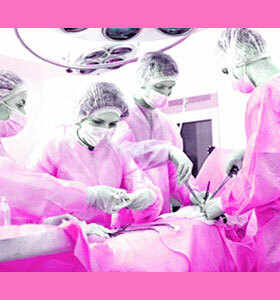 We know it is a trial to endure another surgery, but it is worthwhile if the problem can be permanently corrected. Capsulotomy is less effective at resolving the constriction, but is still appropriate for many women who have less extensive contracture or asymmetrical contracture conditions. Make sure to discuss both options with your doctor, and even get a second opinion, before undergoing either procedure. In addition, talk to your cosmetic surgeon about what steps can be taken to prevent another instance of contracture from occurring. Although it is impossible to completely rule out a recurrence, there are methods which can be used to minimize the risks.